You have the option of publishing your changes 'live' immediately, or saving your changes as a draft. What descriptive information can I add? Rename your dataset, or keep the default provided by Koordinates. 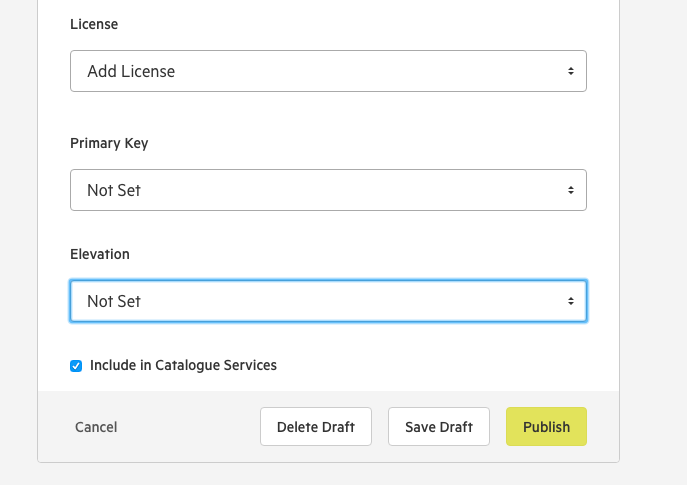 Keep your custom title, or lock it to the authoritative title in your metadata. 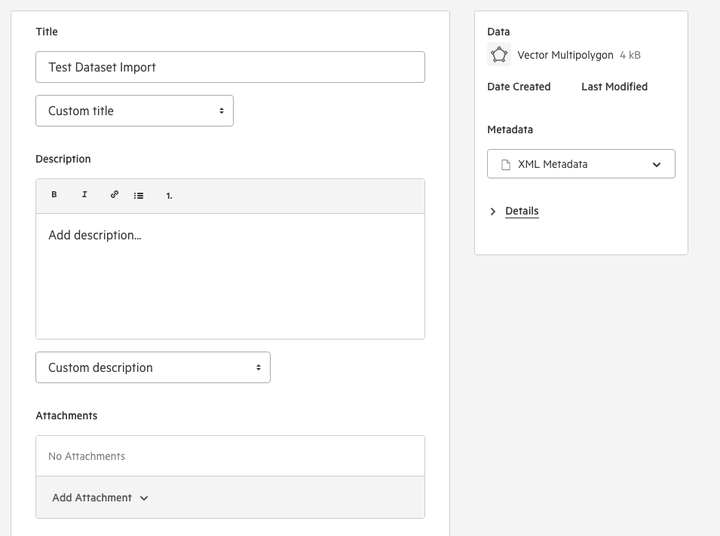 A text field to describe the data layer. Keep your custom description, or lock it to the authoritative description in your metadata. Add an attachment to your data. Learn more about adding attachments. You have the option of adding tags to your data, to assist with search optimisation. Keep your custom tags, or lock it to the authoritative tags in your metadata. This is the organisation or group that owns the data, and is responsible for publishing the data on the Koordinates platform. Choose the category to which the document will belong. This will help users find your dataset, and will be available for them to use as a filter as they browse for data. If your data is free, you will be asked to set a license. If you choose ‘Creative Commons,’ you will be asked to decide which Creative Commons license applies to your work. Add a primary key, if applicable. If you are unsure of whether you should edit this field, leave it unchanged. Set an attribute to represent the elevation (or 'Z') field for your data. Learn more about adding and editing metadata. Decide who can view and download your data.